To Cite: Uysal Yazici M, Sahin S, Ayar G, Azili M N, Koksal T, et al. Factors Affecting Development of Pneumothorax in Critically Ill Children: A 3-Year Study, Iran J Pediatr. Online ahead of Print ; 29(2):e85816. doi: 10.5812/ijp.85816. Background: To determine the factors affecting the development of pneumothorax in critically ill children admitted to pediatric intensive care unit (PICU). Methods: This was a single-centered retrospective case control study comparing the clinical features of mechanically ventilated patients, who developed pneumothorax with matched control cases. Results: The study screened 2850 patients admitted to the PICU over a 3 year period. Among 1140 patients who were mechanically ventilated, 4.4% (n = 50) developed pneumothorax. Median age was 24 months. Patients with pneumothorax were found to have median pediatric risk of mortality (PRISM):26, Pediatric logistic organ dysfunction (PELOD):22 and multiorgan disfuction (MODS):3 whereas in the control group they were 15.5, 12, and 3, respectively. PRISM and PELOD were significantly higher in pneumothorax group. Pneumothorax was observed on the 11.6th day of mechanical ventilation (MV). Pneumothorax was mainly secondary to pneumonia (n = 18, 36%) and MV-related reasons (n = 13, 26%). The risk of pneumothorax was higher when P-mean was > 14 cmH2O and tidal volume (TV) was > 10 mL/kg (P < 0.05). The mean albumin level was 2.7 g/dL in the pneumothorax group compared with 3.6 g/dL in the control group (P < 0.001). The number of days on mechanical ventilator and the duration of hospital stay were statistically significant in pneumothorax group (P < 0.05). The mortality outcome was 44% (n = 22) in the pneumothorax group compared with 6.7% (n = 2) in the control group (P < 0.001). Conclusions: Pneumothorax in critically ill children was related to increased morbidity, mortality and prolonged length of stay in hospital. Higher pediatric risk of mortality (PRISM) and Pediatric logistic organ dysfunction (PELOD) scores were associated with increased risk of pneumothorax. Hypoalbuminemia as a reflection of malnutrition status of patients might be a risk factor. Pneumothorax is a life-threatening condition on the differential diagnosis of respiratory distress and chest pain which requires rapid recognition and quick intervention in children (1, 2). Pneumothorax can be classified into three subgroups as traumatic, iatrogenic and spontaneous. Spontaneous pneumothorax can be categorized as primary and secondary. Asthma, cystic fibrosis, necrotizing pneumonia, malignancy, tobacco use (smoking) and connective tissue disorders are factors that might cause secondary pneumothorax (3, 4). Traumatic pneumothorax can be seen after pulmonary interrupter trauma or iatrogenic pneumothorax (IP) (5), might be due to high respiratory settings including barotrauma/volutrauma secondary to mechanical ventilation (MV) or after an invasive procedure such as catheterization and resuscitation (6-8). The incidence of pneumothorax is estimated to be 6 - 8/100.000 in general population and 7.4 - 18/100.000 in the intensive care unit in the United States of America (9, 10). The physical examination shows serious symptoms and signs (2). Diagnosis can be made with posteroanterior X-ray, ultrasonography and computed tomography scan of the chest (2, 11). In adults pneumothorax is known to be related to prolonged length of stay, and increased morbidity and mortality (12, 13). Nevertheless, in patients of intensive care unit few data define the prognostic factors associated with IP. The current evidences for management of primary spontaneous pneumothorax are not satisfactory and besides, the real incidence and prognostic factors of pneumothorax in children hospitalized in pediatric intensive care unit (PICU) are not known (8, 14). It is important to emphasize that data regarding pneumothorax studies, including those in pediatric patients, in literature are deficient. The studies evaluating the incidence and outcomes of the pneumothorax on mechanically ventilated children will be valuable. Therefore, we aimed to identify risk factors associated with the development of pneumothorax in mechanically ventilated critically ill children admitted to a tertiary PICU over a 3-year period. Secondarily, we suggested that development of pneumothorax in patients of PICU can be prevented. Therefore, it is important to identify risk factors that cause pneumothorax. This is a retrospective matched case-control study including pediatric patients hospitalized in PICU during April 2012 through August 2015. After approval from the Local Ethics Committee, 50 patients who developed pneumothorax and 30 control cases that were followed-up on mechanical ventilator at PICU, were included in the study. In control group, totally 30 patients were matched for gender, age and diagnosis with patients in pneumothorax group during the same time period from patients who were mechanically ventilated and did not have pneumothorax. The cases were matched according to respiratory and non-respiratory diseases. Patients younger than 1 months of age (to exclude birth-related conditions and neonatal period), patients with incomplete medical records, patients who had sustained pneumothorax as a result of an external or surgical trauma and those who had diagnosis of pneumothorax prior to PICU admission were excluded. Children admitted to PICU requiring mechanical ventilation were eligible for the study independent of the primary diagnosis at admission. The analysis of multiple organ dysfunction syndrome (MODS) regarding dysfunction of the cardiovascular, neurologic, respiratory, hematologic, hepatic and renal system was accomplished (15). For the assessment of severity of disease the pediatric risk of mortality (PRISM) III score and pediatric logistic organ dysfunction (PELOD) score was used (16, 17). The patients were divided into two groups to compare the outcomes. MV-related pneumothorax was defined when there was no demonstrable cause of pneumothorax, whereas iatrogenic (procedure-related) pneumothorax was defined it was developed after a medical intervention (5). The control group consisted of mechanically ventilated children who did not develop pneumothorax followed up at the same time in PICU. In our center, we performed positive pressure ventilation as a part of protective lung strategy and as a consequence of this strategy permissive hypercapnia was allowed. During follow-up of the patients we prefer minimally invasive techniques for diagnosis of pneumothorax. Unfortunately due to technical insufficiency high-frequency oscillatory ventilation could not be performed as a part of lung protective strategy in pneumothorax group. The type of mechanical ventilation (non-invasive (BIPAP/CPAP or invasive), the MV parameters of mode and setting, the laboratory parameters, the length of time duration on mechanical ventilation and in the PICU and hospitalization stay were recorded (13). All patients suspected to have pneumothorax were screened with chest x-ray daily for pneumothorax throughout their PICU stay. The patients with no absolute signs of pneumothorax in physical examination were diagnosed with only postero-anterior X-ray graphics of the chest (16). The data were analyzed statistically with a software (Statistical Package for Social Sciences 9 for Windows 20). The normality tests were done. The collected variables were analyzed by using the Student t-test, Pearson chi-square test and Man Whitney U Test. Statistically significant P values were considered as < 0.05. The study screened 2850 patients admitted to the PICU over a 3-year period and it was found that among 1140 patients who were mechanically ventilated 4.4% (n = 50) of the patients had developed pneumothorax. Thirty matched cases that were followed-up on mechanical ventilator at PICU were included in control group. One of our cases had diagnosis of bilateral pneumothorax and three of the cases had diagnosis of recurrent pneumothoraces. In the pneumothorax group there were 27 males compared with13 males in the control group. Median age was 24 months in both groups. Patients with pneumothorax were found to have median PRISM: 26, PELOD: 22 and MODS: 3, whereas in the control group they were 15.5, 12, and 3, respectively. PRISM and PELOD were significantly higher in patients with pneumothorax group (P < 0.001 and P = 0.002, respectively). Pneumothorax was observed on the 11.6th day of MV. Demographic characteristics are shown in Table 1. 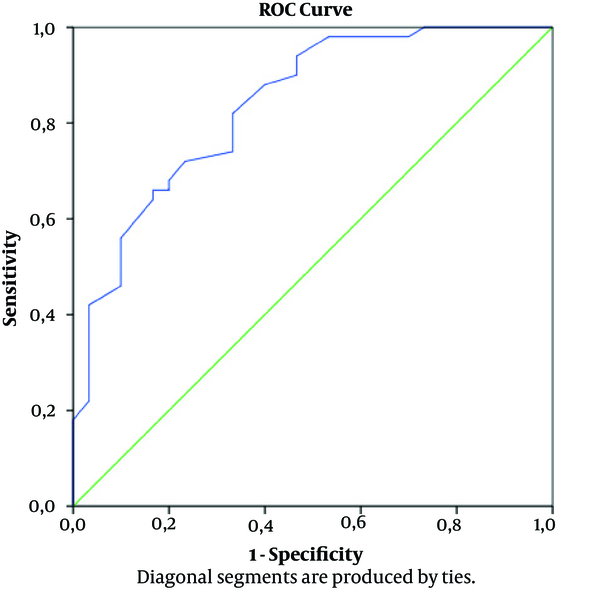 We constructed a ROC curve to determine the accuracy of predicting pneumothorax and the area under the curve (AUC) for PRISM and PLEOD was 0.760 (95% (CI) confidence interval, 0.657 - 0.863; P < 0.001) and 0.702 (95% CI, a positive predictive value 0.586 - 0.818; P = 0.003). ROC curve for PRISM and PELOD is demonstrated in Figure 1. When the PRISM was 24, sensitivity of 52.6% and specificity of 85.7% were demonstrated. One point increase in the PRISM had a positive predictive value (PPV) of 80% and negative predictive value (NPV) of 62.5% and when the PELOD was 22, sensitivity of 52.6% and specificity of 85.7% were observed. One point increase in the PELOD had a PPV of 80% and NPV of 62.5% (Figure 1). Abbreviations: MODS: multiorgan disfuction; NA, not assigned; PELOD: pediatric logistic organ dysfunction; PICU: pediatric intensive care unit; PRISM: pediatric risk of mortality. Upon suspicion of the clinical signs of pneumothorax 68% (n = 34) of the patients were diagnosed with physical examination and postero-anterior X-ray graphics of the chest and 32% (n = 16) had no sign in physical examination. In pneumothorax group, drop of the O2 saturation level below 85% was the most common clinical manifestation (62%). This symptom was followed by bradycardia (31.3%), subcutaneous emphysema (26%), respiratory acidosis (10%) and finally cardiopulmonary arrest (2%). Etiology of pneumothorax was mainly secondary to pneumonia (n = 18, 36%). This was followed by MV-related pneumothorax (n = 13, 26%), reasons of iatrogenic pneumothorax were as follows; after resuscitation (n = 10, 20%), subclavian or jugular catheter insertion (n = 4, 8%), and tracheostomy procedure (n = 3, 6%) and others (n = 2, 4%). In pneumothorax and control group, sepsis was detected in 24 and 12 of the patients, respectively. Acinetobacter was the most common agent for sepsis. The relationship between pneumothorax and sepsis was not significant. In the pneumothorax group, 40 patients had invasive and 10 patients non-invasive supports, whereas 29 patients in the control group received invasive and 1 patient non-invasive support. Invasive mechanical ventilation was found to be a statistically significant risk factor for pneumothorax in both groups (P < 0.05). MV parameters of the two groups are summarized at Table 2. P-mean (cmH2O), tidal volume (TV) (mL/kg) and Fi-O2 values were significant in the two groups (P < 0.05). The risk of pneumothorax was higher when P-mean was > 14 cmH2O and TV was > 10 mL/kg (P < 0.05). This suggests that high P-mean and volutrauma increased the risk of developing pneumothorax. Abbreviations: MV, mechanical ventilation, TV, tidal volume. The mean albumin level was 2.7 g/dL in the pneumothorax group and 3.6 g/dL in the control group and difference was significant (P < 0.001). Lactate levels were also recorded in two groups (Table 1). In ROC curve the accuracy of predicting pneumothorax and the AUC for plasma albumin concentration was 0.837 (95% CI, 0.748 - 0.927; P < 0.001) (Figure 2). It was demonstrated that 2.85 g/dL level of the albumin has sensitivity of 52.6% and specificity of 85.7%. Albumin level of 1 g/dL had a PPV of 80% and NPV of 62.5% (Figure 2). In pneumothorax group; 56% (n = 28) of the patients was followed-up only with high Fi-O2, 8% (n = 4) with simple needle aspiration and underwater drainage, 36% (n = 18) chest tube was surgically administered. The number of days on MV, the duration of PICU stay, and the length of hospital stay were 28.4, 31.1 and 57.1 days in the pneumothorax group compared with 9.9, 17.9 and 29.3 in the control group, respectively. In pneumothorax group MV-days and length of hospitalization stay were statistically significant compared with controls (P < 0.05). The difference in PICU stay was numerically higher in pneumothorax group; but did not reach statistical significance. The mortality outcome was 44% (n = 22) in the pneumothorax group compared with 6.7% (n = 2) in the control group (P < 0.001). The current study demonstrates the potential risk factors that may cause pneumothorax in PICU patients. In addition to that it shows important data regarding prevalence of pneumothorax in PICU patients in our region Ankara, Turkey) in a tertiary center. In a study (18), pneumothorax overall prevalence was 3%, whereas this was 4.4% in the current study. The different prevalence rates might be explained by different patient populations included in the studies. Also, in our study patients had higher PRISM and PELOD scores compared with the reported results of the mentioned study. This indicates that the current study included more complicated poor prognostic patient population. It is understandable to detect higher prevalence rates in our study. Although in the current study rate of pneumothorax was higher than in some of the reported studies, in a recent report of Agency for Healthcare Research and Quality (0.14 IP/1000 discharges) and other pediatric studies (from 0.15 to 0.56 IP/1000 discharge) (19) the rate of pneumothorax was lower than ours. In addition, these studies evidently have underestimated the rate of pneumothorax because they evaluated the administrative data, which was a significant limitation of the studies (20). Therefore, it is not appropriate to compare these studies with results of the current study. In contrast to these data a study from India reported a 10.4% prevalence rate of pneumothorax in PICU patients (21), which was very high compared to reported rate of 4.4% in the current study. Two studies found that the risk of spontaneous pneumothorax was observed 4.2 fold in males compared with females and there was an accumulation at median age of 15, as adolescents (22, 23). We did not observe statistical differences between groups regarding gender and median age. Pneumothorax was observed in average on 11.6th day of mechanical ventilation. In a recent pediatric study, pneumothorax developed on 6.5th day when the diagnosis was respiratory diseases, and on 8th day when there was a non-respiratory etiology (21). In a study reported by Silva and colleagues; duration of MV, PICU and hospital stays were similar between both groups (18). In a study evaluating 1238 pediatric patients admitted to PICU, those with pneumothorax had higher mortality rate (P < 0.001), and longer duration of hospitalization (P < 0.001) (21). Similar to our study ventilated patients who developed pneumothorax had a longer duration of mechanical ventilation compared with ventilated patients without pneumothorax (P < 0.001) (21). This study also reported significantly higher than expected mortality rate in patients with pneumothorax (18) which is very similar to our results. Our study showed that the mean duration of hospital stay was 7 days longer in patients with pneumothorax compared with control group. Hsu et al. demonstrated that in patients on MV, pneumothorax was associated with a significant increase in the length of stay (LOS) in intensive care unit and mortality rate (7). In a study reported by Zhan et al., patients with pneumothorax had extra 4.4 days added to the duration of hospitalization. According to this study, the increased hospitalization stay was added an extra cost of $18000 and 6% risk of hospital death (24). Considering increasing health care expenses the economic issues are very important especially in developing countries. Therefore, it is very important to define factors associated with pneumothorax to put preventive measures in action. The association between invasive procedure and pneumothorax has been evaluated in many reports. However, the possible non-invasive risk factors that might be associated with pneumothorax have not been evaluated in these studies. In the current study we evaluated the nutritional status of patients by checking the albumin level at admission. Therefore, we can evaluate possible association of pneumothorax with nutritional status of the patients. In a study, a low body weight was also associated with high risk of pneumothorax (21). In another study, body weight less than 80 kg was associated with pneumothorax (HR: 2.4 [95% CI, 1.3 - 4.2]), this might be related to malnutrition status of the patients (8). In addition to that in the current study, the patients with pneumothorax had lower body weight compared to control group (6 kg vs. 10 kg). In the same context, it has been observed that albumin level of pneumothorax group was significantly lower compared with control group. It might be interpreted as malnutrition being an increased risk for pneumothorax. In other point of view, as an acute phase protein, hypoalbuminemia is associated with morbidity/mortality regardless of the implicated disease (25). Critically ill pediatric patients with hypoalbuminemia at admission had poor outcome and hypoalbuminemia is defined as a predictive factor for poor prognosis. It is associated with a higher mortality, a LOS in the PICU, as well as longer ventilator use (26). Following the first week of sepsis, infection, trauma, serum albumin level of patients is reduced by about 10 - 15 g/L. In these severe conditions hypoalbuminemia is explained by two mechanisms; increased vascular permeability and decreased synthesis by cytokines such as interleukin-1 (IL-1) (10) and 6 (IL-6) and tumor necrosis factor α (TNFα) (27, 28). Mouse models of pneumothorax have demonstrated increased level of TNFa (13). In current study in pneumothorax group, hypoalbuminemia might have been associated with increased TNFa. In addition, increased IL-6 and TNFα has been reported in lavage fluids of patients with pneumothorax (29). In pneumothorax group decreased level of albumin might be secondary to increased level of IL-6 and TNFα. There are various explanations and hypotheses regarding the association of hypoalbuminemia and increased risk of pneumothorax. Hypoalbuminemia may indicate the deficiency of collagen protein and it may disrupt expansion capacity of lungs. The other point is that hypoalbuminemia is the negative acute phase reactant which might be indicator of increased inflammatory response in these patients. In patients with hypoalbuminemia oncotic pressure decreases and this will cause leakage of fluids to interstitial field. The increased interstitial pressure will cause capillary leak syndrome and pulmonary edema. In order to overcome pulmonary edema the pressure levels of mechanical ventilator increases which will increase the risk of barotraumas. The increased risk of barotrauma may lead to increased risk of lung injury and pneumothorax. In addition, the patients with hypoalbuminemia may have malnutrition. The poor nutritional status of patients increases the risk of pneumothorax. The pediatric intensivists should pay more attention to the nutritional status and albumin level of hospitalized patients. Early interventions can be planned to prevent further deterioration of malnutrition status of these patients. Besides, higher PRISM and PELOD score indicating the severity of illness in these children, can be another possible explanation for development of pneumothorax. In this group of patients albumin is decreased as a negative acute phase reactant. Prior studies have stated that respiratory diseases and pneumonia are important factors predisposing pulmonary barotrauma in mechanically ventilated patients (2, 30). Consistent with the previously established studies, etiology of pneumothorax was mainly secondary to pneumonia (n = 18, 36%), followed by MV-related (n = 13, 26%) cases and after resuscitation (n = 10, 20%). Insertion of a catheter accounted for 8% of pneumothorax cases in our PICU in contrast to an Indian study with 13.2% and this high incidence was attributed to the technique which was not aided with ultrasound guidance (21). The lower incidence rate of pneumothorax in our patients could be explained by placement of central venous catheter by experienced staff that had at least 2 years of catheter placement experience using ultrasound guided technique. Pneumothorax can be induced by thoracic procedures involving the neck (25, 30). This rate was 6% (n = 3) in the current study caused by tracheotomy. However, in literature it has been reported that the invasive thoracic procedures were the most common cause of IP. Among the patients who were followed up in PICU, MV was found to be a risk factor for pneumothorax and this difference was statistically significant between the two groups being consistent with literature (21, 27). This finding underlines that barotrauma, volutrauma and high oxygen levels may cause the pneumothorax. A study reported that, the risk factor for pneumothorax was higher in some diseases such as sepsis and septic shock (21). We found sepsis in 24 patients in the pneumothorax group and in 12 patients in the control group. In contrast to this study, the relationship between pneumothorax and sepsis in some reports was found to be non-significant. In pneumothorax group, drop of O2 saturation level below 85% was the most common clinical manifestation (62%). This was followed by bradycardia (31.3%), subcutaneous emphysema (26%), respiratory acidosis (10%) and cardiopulmonary arrest (2%). In our experience, 68% (n = 34) of the pneumothorax cases was diagnosed with physical examination and X-ray radiography. However 32% (n = 16) of the patients with pneumothorax had no physical signs, and were diagnosed with X-ray radiography of the chest in the upright antero-posterior (AP) position. As previously established, the plain radiograph of the chest is the main radiological instrument for diagnosis of pneumothorax with a sensitivity of 80% in upright posture and 36% - 48% in the AP position (31, 32). Nowadays ultrasonography has become more accessible for diagnosis of pneumothorax with a reported sensitivity of 86% - 98% and a specificity of 97% - 100% (25, 33). Chest computed tomography (CT) is a gold standard tool to for diagnosis and determining of the size of pneumothorax (11). However, the risk of transportation of hemodynamically unstable patients for a tomography scan limits the use of CT for diagnosis of pneumothorax in PICU patients (34). The management modalities of pneumothorax can be listed as just observation without intervention, needle aspiration of air, insertion of an intercostal catheter, and invasive procedures like pleurodesis or pleurectomy (4). The current data shows that 56% (n = 28) of the patients had high Fi-O2 in follow-up. This is consistent with the literature which states that the most of the patients were managed without a therapeutic procedure (22, 35). Simple aspiration is being used more frequently in treating minimal pneumothoraces. A review of 91 consecutive cases has revealed that this technique was especially successful for patients where the amount of the pneumothorax was less than 40% of the chest size (36). A 10 years study carried out at a tertiary children’s hospital reported that, if intercostal catheter management did not resolve the air leak of a spontaneous pneumothorax within five days, surgical approach was necessary to accomplish a full resolution (4). Authors are aware of limitations of the present study related to its single-centered and retrospective design. Due to limited number of patients, they were matched according to respiratory and non-respiratory diseases. The basic strengths of this study are the large amount of clinical and diagnostic data delivered from a tertiary referral unit regarding the pediatric age group which was not sufficiently emphasized in the literature. In conclusion; pneumothorax in critically ill children still remains an important issue related to increased morbidity, mortality and prolonged LOS in hospital. Higher PRISM and PELOD scores were associated with increased possibility of pneumothorax. In the light of our preliminary results hypoalbuminemia might be a risk factor for pneumothorax. For further research, a multicenter approach with larger sample size is required in order to underline this possibility for better management strategies since hypoalbuminemia is an easily detectable and manageable finding. Authors' Contribution: Conception and design, Mutlu Uysal Yazici Collection and assembly of data: Mutlu Uysal Yazici, Ganime Ayar, Mujdem Nur Azili, Tulin Koksal; data analysis and interpretation, Mutlu Uysal Yazici, Sanliay Sahin, Benan Bayrakci; manuscript writing, all authors final approval of manuscript. Ethical Approval: Local Ethics Committee approval was obtained. 1. Sudduth CL, Shinnick JK, Geng Z, McCracken CE, Clifton MS, Raval MV. Optimal surgical technique in spontaneous pneumothorax: A systematic review and meta-analysis. J Surg Res. 2017;210:32-46. doi: 10.1016/j.jss.2016.10.024. [PubMed: 28457339]. 2. Winnie GB, Lossef SV. Pneumothorax. In: Kliegman RM, Stanton BF, St Geme III JW, editors. Nelson textbook of pediatrics. 20th ed. Philadelphia, PA: Elsevier Saunders; 2016. p. 2135-8. 3. Dotson K, Johnson LH. Pediatric spontaneous pneumothorax. Pediatr Emerg Care. 2012;28(7):715-20. quiz 721-3. doi: 10.1097/PEC.0b013e31825d2dd5. [PubMed: 22766594]. 4. O'Lone E, Elphick HE, Robinson PJ. Spontaneous pneumothorax in children: When is invasive treatment indicated? Pediatr Pulmonol. 2008;43(1):41-6. doi: 10.1002/ppul.20734. [PubMed: 18041754]. 5. Kamaloo A, Ahmadipour A, Labbaf A, Hesari E, Valadkhani S, Zebardast J, et al. Why do emergency medicine residents experience burn out? A qualitative study. Iran J Psychiatry. 2017;12(3):214-8. [PubMed: 29062374]. [PubMed Central: PMC5640584]. 6. Hsu CW, Sun SF, Lee DL, Chu KA, Lin HS. Clinical characteristics, hospital outcome and prognostic factors of patients with ventilator-related pneumothorax. Minerva Anestesiol. 2014;80(1):29-38. [PubMed: 24122035]. 7. Hsu CW, Sun SF. Iatrogenic pneumothorax related to mechanical ventilation. World J Crit Care Med. 2014;3(1):8-14. doi: 10.5492/wjccm.v3.i1.8. [PubMed: 24834397]. [PubMed Central: PMC4021154]. 8. de Lassence A, Timsit JF, Tafflet M, Azoulay E, Jamali S, Vincent F, et al. Pneumothorax in the intensive care unit: incidence, risk factors, and outcome. Anesthesiology. 2006;104(1):5-13. doi: 10.1097/00000542-200601000-00003. [PubMed: 16394682]. 9. Eckstein M, Henderson SO. Thoracic trauma. In: Marx JA, Hockberger RS, Walls RM, editors. Rosen's emergency medicine: Concepts and clinical practice. 8th ed. Philadelphia, PA: Elsevier Saunders; 2014. 10. Robinson PD, Cooper P, Ranganathan SC. Evidence-based management of paediatric primary spontaneous pneumothorax. Paediatr Respir Rev. 2009;10(3):110-7. quiz 117. doi: 10.1016/j.prrv.2008.12.003. [PubMed: 19651381]. 11. Littmann L, Proctor P. Real time recognition of the electrocardiographic "spiked helmet" sign in a critically ill patient with pneumothorax. Int J Cardiol. 2014;173(3):e51-2. doi: 10.1016/j.ijcard.2014.03.105. [PubMed: 24698249]. 12. Esteban A, Anzueto A, Frutos F, Alia I, Brochard L, Stewart TE, et al. Characteristics and outcomes in adult patients receiving mechanical ventilation: A 28-day international study. JAMA. 2002;287(3):345-55. doi: 10.1001/jama.287.3.345. [PubMed: 11790214]. 13. Kalomenidis I, Moschos C, Kollintza A, Sigala I, Stathopoulos GT, Papiris SA, et al. Pneumothorax-associated pleural eosinophilia is tumour necrosis factor-alpha-dependent and attenuated by steroids. Respirology. 2008;13(1):73-8. doi: 10.1111/j.1440-1843.2007.01153.x. [PubMed: 18197914]. 14. Miller MR, Zhan C. Pediatric patient safety in hospitals: A national picture in 2000. Pediatrics. 2004;113(6):1741-6. doi: 10.1542/peds.113.6.1741. [PubMed: 15173500]. 15. Graciano AL, Balko JA, Rahn DS, Ahmad N, Giroir BP. The pediatric multiple organ dysfunction score (P-MODS): Development and validation of an objective scale to measure the severity of multiple organ dysfunction in critically ill children. Crit Care Med. 2005;33(7):1484-91. doi: 10.1097/01.CCM.0000170943.23633.47. [PubMed: 16003052]. 16. Pollack MM, Patel KM, Ruttimann UE. PRISM III: An updated pediatric risk of mortality score. Crit Care Med. 1996;24(5):743-52. doi: 10.1097/00003246-199605000-00004. [PubMed: 8706448]. 17. Leteurtre S, Duhamel A, Salleron J, Grandbastien B, Lacroix J, Leclerc F, et al. 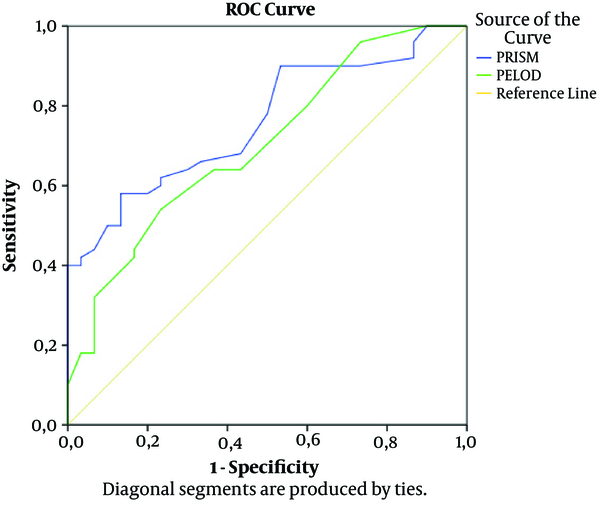 PELOD-2: An update of the PEdiatric logistic organ dysfunction score. Crit Care Med. 2013;41(7):1761-73. doi: 10.1097/CCM.0b013e31828a2bbd. [PubMed: 23685639]. 18. da Silva PS, de Aguiar VE, Fonseca MC. Iatrogenic pneumothorax in mechanically ventilated children: Incidence, risk factors and other outcomes. Heart Lung. 2015;44(3):238-42. doi: 10.1016/j.hrtlng.2015.01.005. [PubMed: 25680806]. 19. Friedman B, Berdahl T, Simpson LA, McCormick MC, Owens PL, Andrews R, et al. Annual report on health care for children and youth in the United States: Focus on trends in hospital use and quality. Acad Pediatr. 2011;11(4):263-79. doi: 10.1016/j.acap.2011.04.002. [PubMed: 21640682]. 20. Miller MP, Sagy M. Pressure characteristics of mechanical ventilation and incidence of pneumothorax before and after the implementation of protective lung strategies in the management of pediatric patients with severe ARDS. Chest. 2008;134(5):969-73. doi: 10.1378/chest.08-0743. [PubMed: 18689581]. 21. El-Nawawy AA, Al-Halawany AS, Antonios MA, Newegy RG. Prevalence and risk factors of pneumothorax among patients admitted to a Pediatric Intensive Care Unit. Indian J Crit Care Med. 2016;20(8):453-8. doi: 10.4103/0972-5229.188191. [PubMed: 27630456]. [PubMed Central: PMC4994124]. 22. Dotson K, Timm N, Gittelman M. Is spontaneous pneumothorax really a pediatric problem? A national perspective. Pediatr Emerg Care. 2012;28(4):340-4. doi: 10.1097/PEC.0b013e31824d9a65. [PubMed: 22453728]. 23. Gupta D, Hansell A, Nichols T, Duong T, Ayres JG, Strachan D. Epidemiology of pneumothorax in England. Thorax. 2000;55(8):666-71. doi: 10.1136/thorax.55.8.666. [PubMed: 10899243]. [PubMed Central: PMC1745823]. 24. Zhan C, Smith M, Stryer D. Accidental iatrogenic pneumothorax in hospitalized patients. Med Care. 2006;44(2):182-6. doi: 10.1097/01.mlr.0000196938.91369.2a. [PubMed: 16434918]. 25. Johnson NN, Toledo A, Endom EE. Pneumothorax, pneumomediastinum, and pulmonary embolism. Pediatr Clin North Am. 2010;57(6):1357-83. doi: 10.1016/j.pcl.2010.09.009. [PubMed: 21111122]. 26. Kittisakmontri K, Reungrongrat S, Lao-Araya M. Hypoalbuminaemia at admission predicts the poor outcomes in critically ill children. Anaesthesiol Intensive Ther. 2016;48(3):158-61. doi: 10.5603/AIT.a2016.0028. [PubMed: 27198541]. 27. Weg JG, Anzueto A, Balk RA, Wiedemann HP, Pattishall EN, Schork MA, et al. The relation of pneumothorax and other air leaks to mortality in the acute respiratory distress syndrome. N Engl J Med. 1998;338(6):341-6. doi: 10.1056/NEJM199802053380601. [PubMed: 9449726]. 28. Nicholson JP, Wolmarans MR, Park GR. The role of albumin in critical illness. Br J Anaesth. 2000;85(4):599-610. doi: 10.1093/bja/85.4.599. [PubMed: 11064620]. 29. De Smedt A, Vanderlinden E, Demanet C, De Waele M, Goossens A, Noppen M. Characterisation of pleural inflammation occurring after primary spontaneous pneumothorax. Eur Respir J. 2004;23(6):896-900. doi: 10.1183/09031936.04.00079304. [PubMed: 15219004]. 30. Lew TW, Kwek TK, Tai D, Earnest A, Loo S, Singh K, et al. Acute respiratory distress syndrome in critically ill patients with severe acute respiratory syndrome. JAMA. 2003;290(3):374-80. doi: 10.1001/jama.290.3.374. [PubMed: 12865379]. 31. Wilkerson RG, Stone MB. Sensitivity of bedside ultrasound and supine anteroposterior chest radiographs for the identification of pneumothorax after blunt trauma. Acad Emerg Med. 2010;17(1):11-7. doi: 10.1111/j.1553-2712.2009.00628.x. [PubMed: 20078434]. 32. Rowan KR, Kirkpatrick AW, Liu D, Forkheim KE, Mayo JR, Nicolaou S. Traumatic pneumothorax detection with thoracic US: Correlation with chest radiography and CT--initial experience. Radiology. 2002;225(1):210-4. doi: 10.1148/radiol.2251011102. [PubMed: 12355007]. 33. Lobo V, Weingrow D, Perera P, Williams SR, Gharahbaghian L. Thoracic ultrasonography. Crit Care Clin. 2014;30(1):93-117. v-vi. doi: 10.1016/j.ccc.2013.08.002. [PubMed: 24295842]. 34. Yarmus L, Feller-Kopman D. Pneumothorax in the critically ill patient. Chest. 2012;141(4):1098-105. doi: 10.1378/chest.11-1691. [PubMed: 22474153]. 35. Wilcox DT, Glick PL, Karamanoukian HL, Allen JE, Azizkhan RG. Spontaneous pneumothorax: A single-institution, 12-year experience in patients under 16 years of age. J Pediatr Surg. 1995;30(10):1452-4. doi: 10.1016/0022-3468(95)90405-0. [PubMed: 8786487]. 36. Chan SS, Lam PK. Simple aspiration as initial treatment for primary spontaneous pneumothorax: Results of 91 consecutive cases. J Emerg Med. 2005;28(2):133-8. doi: 10.1016/j.jemermed.2004.11.001. [PubMed: 15707806].